High cost is only one of the challenges electric vehicle makers face as they strive to make products that can compete with fossil fuel-driven two- and four-wheelers. An equally big challenge is dealing with breakdowns and keeping electric vehicles up and running. Twenty Two Motors Pvt. Ltd, an electric scooter startup, is using artificial intelligence and Internet of Things to solve this problem. 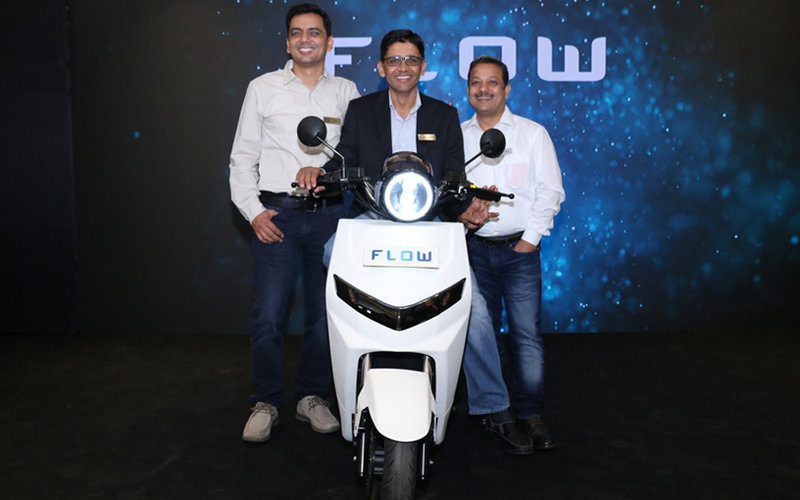 The Gurugram-based company, which began operations in 2016, launched its first electric scooter called Flow earlier this year and is developing three more. The scooters are fitted with as many as 60 IoT sensors that provide essential data the company can use to gauge the performance of the vehicles, co-founder and CEO Parveen Kharb told TechCircle. “We may not be using high-end tech such as LiDAR (Light Detection and Ranging) or aiming for self-driving but we are looking at changing how electric two-wheelers work with the use of AI and IoT,” said Kharb, an engineering graduate from Kurukshetra University who founded the company along with IIT-Delhi alumnus Vijay Chandrawat. Kharb explains how the sensors help the company. To remain prepared to service the scooters on road, the company must know factors such as riders’ behavior, the road condition and other driving conditions. While the scooters have regular sensors such as accelerometer and gyroscope, they also have other sensors that feed data via machine-to-machine (M2M) chips to its cloud servers. This data covers speed, acceleration, distance covered, condition of the battery and other critical components. The data are then run through algorithms to simulate the scooters’ future condition in terms of kilometres. In other words, this tells the company how the scooter will perform after running 50 kms more than it already has. By running this simulation the company gauges the vehicle's condition so that it can relay important information to the customer in cases of mechanical failures or if a part has to be replaced. In fact, Kharb said the company will service the vehicles itself in case of such issues. “We can service our vehicles easily because the data points we are collecting will tell us what exactly is wrong with the scooter,” he said. Essentially, the use of all these technologies helps minimise breakdowns, ensure servicing when required--and not after a certain time or distance covered--and order spare parts automatically before any failure happens. To be sure, Twenty Two Motors isn't the only electric two-wheeler maker in India. Several other startups have entered this segment over the past few years and raised funding. Twenty Two Motors had raised$1.6 million in seed funding last year. Kharb said he was looking to raise another $20 million in the second round. Others include Ampere Vehicles Pvt. Ltd, TVS Motor-backed Ultraviolette Automotive Pvt. Ltd; Tork Motorcycles and Emflux Motors Pvt. Ltd. The most-funded electric two-wheeler startup, however, is Ather Energy Pvt. Ltd, which counts Hero MotoCorp Ltd and US-based Tiger Global among its main investors. In June, Ather launched two scooters that it says are packed with"intelligent" features such as remote diagnostics. Ather's scooters are costlier than the Flow, which is priced at Rs 74,740. Both companies claim their scooters can travel around 60-80 km on a single charge. While the Flow clocks a top speed of 60 km per hour, Ather's scooters can go up to 80 km an hour. "Slow speeds and distances were a huge issue with electric scooters and then there was the problem of charging. We think we have solved all these problems to an extent," said Kharb. "We have included an extra portable battery, so that people can charge one battery while using the other. One battery takes up to four hours to charge," he said. Apart from hardware improvements, the startup is continuing to develop its AI and train its machine learning models by running a bunch of test scooters every day for 250 kilometres. "We want to collect more data to come up with more use cases for consumers," Kharb said. One such use case could be to let parents of bike riders know about their children's location and speeds at which they were riding the vehicle. Noida-based IoT services firm Aeris Communications' president Rishi Mohan Bhatnagar had told TechCircle last month that two-wheeler companies could put sensors into motorcycles in order to give such information to parents. Twenty Two Motors is aiming to sell 50,000 vehicles in the next one year and 200,000 in the next three years. The startup is not only targeting individual customers for its scooters but also wants to aim at enterprises. "Imagine the fuel costs companies such as Pizza Hut, Domino's, Zomato, Foodpanda and Swiggy can save if they use our scooters in their daily operations," Kharb said, adding that he was in talks with some companies involved in freight and food delivery. The startup is also open to selling software to its enterprise customers to give them more control of the product. "Our enterprise software can do fleet management, find out about each rider's behaviour and the location of the vehicle, among other things," Kharb said. *This article has been modified to correct the top speed of Ather's scooters.